We didn’t set out to start an ice cream company. In fact, we set out to make high-quality, house-made, hand-packed ice cream in fanciful flavors to serve in our Fine Dining Restaurant Group restaurants. 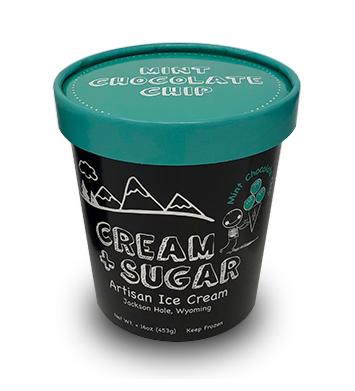 As fate would have it, once our guests tasted the sweet treats, they started asking where they could buy a pint or a container to take home with them. From a small space in the back of one of our restaurant kitchens, production grew, leading chef Chad Horton to bring on more team members to simply keep up with the demand for our frozen treats - team members whose entire job was (and continues to be) assembling ice cream sandwiches and packing pints. 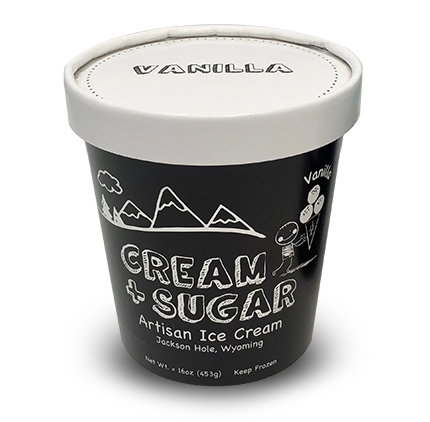 With two specialty stores in the Fine Dining family in which we could sell our products, we started packaging our ice cream sandwiches in quart containers and ice cream in blank white pints, calling them Cream + Sugar, slapping a sticker on them and selling them to eager customers. Word made it around Jackson Hole. Pretty soon, we couldn’t keep the ice cream sandwiches on the shelves and nearly as soon as we restocked them, the containers were gone. This sparkled something in owner Gavin Fine’s mind. It was time to go big or go home. With plans to build a large commissary and test kitchen already in place, Gavin decided to dedicate an entire area of the new Fine Dining facility to Cream + Sugar. Opened in 2017, the new home for Cream + Sugar allowed the chef-driven dessert team to increase production and begin packaging frozen treats for other area stores. Our team, table and freezer space may have grown, but our approach has not. 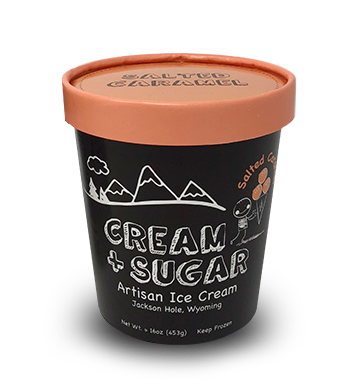 All Cream + Sugar ice creams are still made by hand using milk and cream from regionals farms, cookies are baked daily, and everything is assembled and packaged by our team before making its way to grocery shelves. Why not use machines to automate and speed up the packaging process? The answer is simple – we believe our hand-made approach is evident in every last drip. No matter the creation, each Cream + Sugar product is spun with love, knowing that life is simply better with ice cream. Follow along with our ice cream dreams.